On April 4, 2000, the lives of Lisa and Roy of Keller, Texas were changed forever. They received a very special gift, a new little baby girl. Lisa and Roy had chosen the name Kelsey Shaye Whiting for their new little bundle of joy. It seemed to Lisa that Kelsey would never be born, but she finally arrived at Baylor Medical Center of Grapevine at exactly 11:00 A.M.
Lisa was filled with joy when she heard Dr. Timothy Rost say, "Congratulations, you have a beautiful baby girl." Wrapped snugly in a soft, warm blanket, Kelsey was handed to Lisa, who held her new little miracle for the first time. She thought Kelsey was the most beautiful baby she had ever seen and that she was so small and cuddly. Kelsey's birth was a brand new beginning for her mommy and daddy. Kelsey will get all the love and care she needs from her new family, and she will bring lots of joy and happiness to their lives. Friends and family were anxiously awaiting Kelsey's birth. When they heard the good news, they showered her with lots of gifts. Some were clothes, some were blankets to keep her nice and warm, some were bottles, and oh, some were diapers, of course. All the nurses thought Kelsey was the cutest little girl, and they enjoyed taking care of her. Even the doctors were amazed at this new little arrival into the world. After Kelsey came home from the hospital, she soon settled into daily routines. Lisa was very excited to give Kelsey her first bath. Afterwards, she gently covered her with powder and dressed her in tiny, warm baby clothes. Lisa thought about all the babies who are born all around the world and realized how all parents must feel... that their baby is the most beautiful of all. And, they are right. Many people came to visit Kelsey. Granny, Paw Paw, Uncle Jamie, and Aunt Alysa had been eagerly waiting for Kelsey to be born. When they saw her, they thought Kelsey was the most precious little person and that her skin was so soft and smooth. Every day, Lisa and Roy think of how blessed they are that Kelsey has become a part of their lives and how full their lives will be in the years ahead. There will be laughter and joy, boo-boos and tears, and really big hugs to chase away the fears. Mommy and Daddy are looking forward to Kelsey's first smile, the first time she crawls, her first steps, the first time she feeds herself, and even that all important potty training time. Often, on bright sunny days, Mommy sits outside and just holds and cuddles Kelsey. She enjoys rocking her and singing to her. As she looks at Kelsey, her heart is full of love for this special little gift she has received. Daddy enjoys helping Mommy take care of Kelsey. Sometimes he reads to her, sometimes he feeds her, and sometimes he even helps give Kelsey her bath. These are very special times for Daddy and Kelsey. While Lisa and Roy were waiting for Kelsey to be born, they prepared a room especially for her. They placed a cozy, warm bed for Kelsey to sleep in and a big rocking chair so that they can hold and rock her, or just sit and look at her. On April 4, 2000, the lives of Lisa and Roy of Keller, Texas were changed forever. They received a very special gift from God....a new little baby girl. It seemed to Lisa that Kelsey would never be born, but she finally arrived, just as God planned, at Baylor Medical Center of Grapevine at exactly 11:00 A.M.
Lisa was filled with joy when she heard Dr. Timothy Rost say, "Congratulations, you have a beautiful baby girl." God had answered her prayers. Wrapped snugly in a soft, warm blanket, Kelsey was handed to Lisa, who held her new little miracle for the first time. She was so small and cuddly. Lisa thought Kelsey was the most beautiful baby she had ever seen and she thanked God for her. Friends and family were anxiously awaiting Kelsey's arrival. When they heard the good news, they showered her with lots of gifts. Some were clothes, some were blankets to keep her nice and warm, some were bottles, and oh, some were diapers, of course. Lisa and Roy were told that when Kelsey was born, all the nurses thought she was the cutest little girl, and they enjoyed taking care of her. Even the doctors were amazed at this new little arrival into the world. God creates babies all around the world. Every mom and dad feel that their baby is the most beautiful of all, and they are all right. Often, on bright sunny days, Mommy sits outside and just holds and cuddles Kelsey. She enjoys rocking her and singing to her. As she looks at Kelsey, her heart is full of love for this special little gift she has received from God. She is looking forward to showing her this beautiful world that God has created, and telling her about God's son, Jesus. While Mommy and Daddy were waiting for Kelsey to come to live with them, they prepared a room especially for her. They placed a cozy, warm bed for Kelsey to sleep in and a big rocking chair so that they can hold and rock her, or just sit and look at her. Lisa was filled with joy when she heard Dr. Timothy Rost say, "Congratulations, you have a beautiful baby girl." The Lord had answered her prayers. On April 8, 2000, the lives of Lisa and Roy of Keller, Texas were changed forever. They received a very special gift....a new little baby girl. Kelsey's adoption was a new beginning for her mommy and daddy. Kelsey will get all the love and care she needs from her new family and she will bring lots of joy and happiness to their lives. After Kelsey finally came to live with Lisa and Roy, she soon settled into daily routines. Many people came to visit Kelsey. Granny, Paw Paw, Uncle Jamie, and Aunt Alysa had been eagerly waiting for Kelsey to come to live with Lisa and Roy. When they saw Kelsey, they thought she was the most precious little person and that her skin was so soft and smooth. Daddy enjoys helping Mommy take care of Kelsey. Sometimes he reads to her, sometimes he feeds her, and sometimes he even helps give Kelsey her bath. These are special times for Daddy and Kelsey. On October 28, 1999, the lives of Stacey and Tom of Greenville, Indiana were changed forever. They received two very special gifts....two beautiful new little girls. Stacey and Tom had chosen the names Makenzie Marie McClanahan and Makayla Ann McClanahan for their new little bundles of joy. It seemed to Stacey that Makenzie and Makayla would never be born, but Makenzie finally arrived at exactly 4:49 P.M. and Makayla arrived at 4:50 P.M. at Floyd Memorial Hospital. Stacey was filled with joy when she heard Dr. Mahan say, "Congratulations, you have two beautiful baby girls." Wrapped snugly in soft, warm blankets, Makenzie was handed to Stacey on one arm and Makayla on the other, and she held her new little miracles for the first time. She thought Makenzie and Makayla were the most beautiful babies she had ever seen and they were so small and cuddly. Makenzie's and Makayla's births were a brand new beginning for their mommy and daddy. Makenzie and Makayla will get all the love and care they need from their new family, and they will bring lots of joy and happiness to Mommy's and Daddy's lives. Friends and family were anxiously awaiting Makenzie's and Makayla's births. When they heard the good news, they showered them with lots of gifts. Some were clothes, some were blankets to keep them nice and warm, some were bottles, and oh, some were diapers, of course. All the nurses thought Makenzie and Makayla were the cutest little babies, and they really enjoyed taking care of them. Even the doctors were amazed at these new little arrivals into the world. After Makenzie and Makayla came home from the hospital, they soon settled into daily routines. Stacey was very excited to give Makenzie and Makayla their first bath. Afterwards, she gently covered them with powder and dressed them in tiny, warm baby clothes. Stacey thought about all the babies who are born all around the world, and realized how all parents must feel... that their baby is the most beautiful of all. And, they are right. Many people came to visit Makenzie and Makayla. Grandpa's, Grandma's, and friends had been eagerly waiting for them to be born. When they saw them, they thought Makenzie and Makayla were the most precious little babies and that their skin was so soft and smooth. Every day, Stacey and Tom think of how blessed they are that Makenzie and Makayla have become a part of their lives and how full their lives will be in the years ahead. There will be laughter and joy, boo-boos and tears, and really big hugs to chase away the fears. Mommy and Daddy are looking forward to Makenzie's and Makayla's first smile, the first time they crawl, their first steps, the first time they feed themselves, and even that all important potty training time. Often, on bright sunny days, Mommy sits outside and just holds and cuddles Makenzie and Makayla. She enjoys rocking them and singing to them. As she looks at Makenzie and Makayla, her heart is full of love for these special little gifts she has received. Daddy enjoys helping Mommy take care of Makenzie and Makayla. Sometimes he reads to them, sometimes he feeds them, and sometimes he even helps give Makenzie and Makayla their baths. These are very special times for Daddy, Makenzie and Makayla. While Stacey and Tom were waiting for Makenzie and Makayla to be born, they prepared a room especially for them. They placed two cozy, warm beds for Makenzie and Makayla to sleep in and a big rocking chair so that they can hold and rock them, or just sit and look at them. On July 8, 2001, the life of Lisa Davidson of Round Rock, Texas was changed forever. She received a very special gift....a new little baby girl. Lisa had chosen the name Makayla Renee Davidson for her new little bundle of joy. Lisa was filled with joy when she saw her beautiful little girl. Wrapped snugly in a soft, warm blanket, Makayla was handed to Lisa, who held her new little miracle for the first time. She thought Makayla was the most beautiful little girl she had ever seen and that she was so small and cuddly. Makayla's birth was a new beginning for her mommy. Makayla will get all the love and care she needs from her new family and she will bring lots of joy and happiness to Lisa's life. Friends and family were anxiously awaiting Makayla's birth. When they heard the good news, they showered her with lots of gifts. Some were clothes, some were blankets to keep her nice and warm, some were bottles, and oh, some were diapers, of course. All the nurses thought Makayla was so cute and they enjoyed taking care of her. Even the doctors were amazed at this new little arrival into the world. Even though it could be messy, Lisa thought bathtime with Makayla was still fun. Afterwards, she gently covered her with powder and dressed her in tiny, warm baby clothes. Many people came to visit Makayla. Grandma Debbie, Oma, and Cousin Jenny had been eagerly waiting for Makayla to be born. When they saw Makayla, they thought she was the most precious little person and that her skin was so soft and smooth. Every day, Lisa thinks of how blessed she is that Makayla has become a part of her life and how full her life will be in the years ahead. There will be laughter and joy, boo-boos and tears, and really big hugs to chase away the fears. Mommy is looking forward to Makayla's first smile, the first time she crawls, her first steps, the first time she feeds herself, and even that all important potty training time. Often, on bright sunny days, Mommy sits outside and just holds and cuddles Makayla. She enjoys rocking her and singing to her. As she looks at Makayla, her heart is full of love for this special little gift she has received. Mommy enjoys taking care of Makayla, but sometimes others like to help. Sometimes they read to her, sometimes they help feed her, and sometimes they help give Makayla her bath. These are special times to all those who love Makayla. While Mommy was waiting for Makayla to be born, she prepared a room especially for her. Mommy placed a cozy, warm bed for Makayla to sleep in and a big rocking chair so that she can hold and rock her, or just sit and look at her. On November 26, 2001, the lives of Missy and Joe of Atlanta were changed forever. They received a very special gift...a little new baby boy. Missy and Joe had chosen the name Michael Jeremy Smith for their little new bundle of joy and decided to call him Mike. It seemed to Missy that Mike might never be born. Yet he finally arrived even earlier than anticipated, at Sacred Heart Hospital at exactly 4:48 p.m.
Missy was filled with joy when she heard Dr. Salinger say, "Congratulations, you have a handsome little boy." Wrapped snugly in a soft, warm blanket, Mike was handed to Missy, who held her little miracle for the first time. She thought that Mike was such a beautiful baby and that he was so cuddly and small. Mike's birth was a brand new beginning for his mommy and daddy. Mike will get all of the love and care he needs from his new family, and he will bring lots of joy and happiness to their lives. 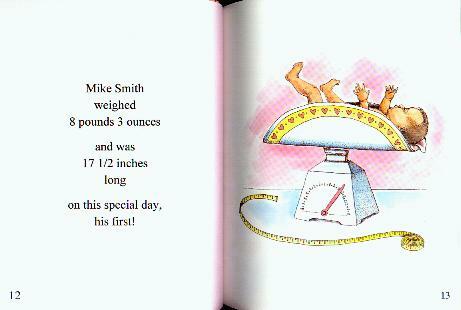 As soon as Mike was born, he was placed on the scales. Friends and family were anxiously awaiting Mike's birth. When they heard that he had surprised his mommy and daddy and arrived sooner than planned, they showered him with many gifts. Some were clothes, some were blankets to keep him nice and warm, some were bottles, and some were diapers, of course. All of the nurses thought that Mike was the cutest little boy they had ever seen, and they enjoyed taking care of him. Even the doctors were amazed at this little new arrival into the world. After Mike came home from the hospital, he soon settled into his daily routines. Missy was very excited to give Mike his first bath. Afterwards, she gently covered him with powder, and dressed him in tiny, warm baby clothes. Missy thought about all of the babies who are born all around the world and realized how all parents must feel...that their baby is the most beautiful of all. And they are right. Many people came to visit Mike. Grandma and Grandpa Smith, Uncle Mark and Aunt Sally had been eagerly waiting for Mike to come to live with Missy and Joe. When they saw Mike, they thought he was the most precious little person ever, and that his skin was very soft and smooth. Every day, Missy and Joe think of how blessed they are that Mike has become a part of their lives, and how full their lives will be in the years ahead. There will be laughter and joy, boo-boos and tears, and really big hugs to chase away the fears. Mommy and Daddy are looking forward to Mike's first smile, the first time he crawls, his first steps, the first time he feeds himself, and even that all-important potty training time. Often, on bright sunny days, Mommy sits outside and holds and cuddles Mike. She enjoys rocking him and singing to him. As she looks at Mike, her heart is full of love for this special little gift she has received. Daddy enjoys helping Mommy take care of Mike. Sometimes he reads to him, sometimes he feeds him, and sometimes he even helps give Mike his bath. These are very special times for Daddy and Mike. Sometimes, Mommy and Daddy take Mike for long walks. Mike just smiles, coos, and makes cute little faces all along the way. As they walk, Mommy and Daddy talk about all of the plans they have for Mike's future and all of the exciting things they will do together as a family. They will make memories that will last forever.